Wisconsinite Jeff Butler, front, and another Swamp Ape were part of a small group that paddled into a nesting area near Big Cypress National Park in south Florida early in March. Although they didn’t track down any pythons that day, Butler said he is eager to go back next winter because of the camaraderie with other military veterans. Lynn Marty and her husband, Randy, bought the Chetek Bakery in 2000. The popular downtown bakery opened its doors in 1937 and has been open continuously since then. The Chetek Bakery has been a mainstay on Chetek’s Main Street since 1937. It has had only three owners through the years. A variety of doughnuts and other baked goods awaited customers at the Chetek Bakery. A freshly baked pan of butterscotch treats cooled on top of the bakery case at the Chetek Bakery. Editor’s note: In this installment of Country Matters, we look at small-town bakeries across Wisconsin. While the number of bakeries has declined through the years, many local bakeries continue to thrive. 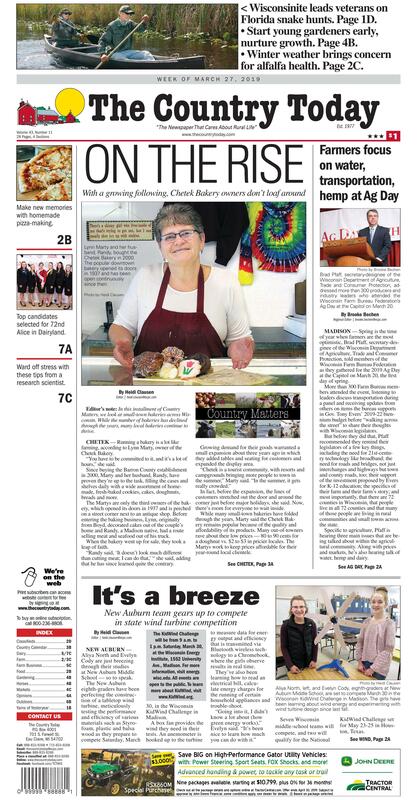 CHETEK — Running a bakery is a lot like farming, according to Lynn Marty, owner of the Chetek Bakery. “You have to be committed to it, and it’s a lot of hours,” she said. Since buying the Barron County establishment in 2000, Marty and her husband, Randy, have proven they’re up to the task, filling the cases and shelves daily with a wide assortment of homemade, fresh-baked cookies, cakes, doughnuts, breads and more. The Martys are only the third owners of the bakery, which opened its doors in 1937 and is perched on a street corner next to an antique shop. Before entering the baking business, Lynn, originally from Boyd, decorated cakes out of the couple’s home and Randy, a Madison native, had a route selling meat and seafood out of his truck. When the bakery went up for sale, they took a leap of faith. “Randy said, ‘It doesn’t look much different than cutting meat; I can do that,’ “ she said, adding that he has since learned quite the contrary. Growing demand for their goods warranted a small expansion about three years ago in which they added tables and seating for customers and expanded the display area. In fact, before the expansion, the lines of customers stretched out the door and around the corner just before major holidays, she said. Now, there’s room for everyone to wait inside. While many small-town bakeries have folded through the years, Marty said the Chetek Bakery remains popular because of the quality and affordability of its products. Many out-of-towners rave about their low prices — 80 to 90 cents for a doughnut vs. $2 to $3 in pricier locales. The Martys work to keep prices affordable for their year-round local clientele. Days are long for the Martys: Lynn often can be found in the bakery by 6 a.m. and stays until 6 p.m. — even later in the summer. Randy comes in about 7 p.m. to begin the overnight baking. By 5:30 a.m., he’s on the road for deliveries, which include stops at Jennie-O Turkey Store in Barron, Brion’s Smokehouse Deli in Cameron and the Bridge Stop in Chetek. They deliver doughnuts for the Jennie-O Turkey Store cafeteria, as well as cakes for employee anniversary parties and buns — more than 100 dozen at a time — for holiday parties. The Barron company also buys cookies to donate locally. The Chetek Bakery also takes regular custom orders from individuals; they’re gearing up for Easter dinners, graduation parties and weddings. Most orders come through word of mouth — literally. Marty said she has baked as many as three wedding cakes in a weekend. Marty said customers like that their cakes are fresh, as opposed to those from Walmart, which likely have been frozen and could be a few weeks old by the time customers get it. Among the Martys’ most popular items are their double-chocolate doughnuts and cinnamon sticks (also known as pie crust sticks). “It’s like eating potato chips; you can’t eat just one,” she said. After all her years of baking, one might presume that Marty’s creative juices have run dry, but she still enjoys experimenting with new methods, especially when it comes to decorating. “What makes it fun is I like to kind of try different things, new things,” she said. The Martys have seven employees, including a few high school students, and they’re looking to add a couple more people on both the day and night shifts. Those extra hands will be a big help as the bakery’s fall and winter soup lunch special menu switches over in April to a brand-new sandwich line. “Obviously, we’ve got the bread and croissants,” she said. Along with the nine kinds of bread they offer daily, the Chetek Bakery has another 35 to 40 types of bread, such as bacon ranch bread and wild rice cranberry bread, that they sell in rotation, usually a couple at a time. Many of their recipes, including the one they use for their famous baked beans, date back to the bakery’s original owners. While recent low-carbohydrate diet fads sometimes take a toll on baked-goods sales, Marty said everyone deserves an occasional indulgence. Aliya North, left, and Evelyn Cody tested one of the wind turbines they built last week at New Auburn Middle School. The eighth-graders will compete for the first time Saturday in the Wisconsin KidWind Challenge in Madison. Aliya North, left, and Evelyn Cody, eighth-graders at New Auburn Middle School, are set to compete March 30 in the Wisconsin KidWind Challenge in Madison. The girls have been learning about wind energy and experimenting with wind turbine design since last fall. NEW AUBURN — Aliya North and Evelyn Cody are just breezing through their studies at New Auburn Middle School — so to speak. The New Auburn eighth-graders have been perfecting the construction of a tabletop wind turbine, meticulously testing the performance and efficiency of various materials such as Styrofoam, plastic and balsa wood as they prepare to compete Saturday, March 30, in the Wisconsin KidWind Challenge in Madison. A box fan provides the wind they need in their tests. An anemometer is hooked up to the turbine to measure data for energy output and efficiency that is transmitted via Bluetooth wireless technology to a Chromebook, where the girls observe results in real time. They’ve also been learning how to read an electrical bill, calculate energy charges for the running of certain household appliances and trouble-shoot. Seven Wisconsin middle-school teams will compete, and two will qualify for the National KidWind Challenge set for May 23-25 in Houston, Texas. Participants discover the promise and limitations of wind energy technology by designing, building and testing their own functional creative wind turbine. The event consists of wind turbine performance tests, prepared presentations by teams and judges’ questioning. Teams design and assemble wind turbines, building gear trains and blades that are attached to a 2-watt generator, then placed in a 4-foot-square wind tunnel with a 4- to 5-meter-per-second wind flow. Energy produced in 30 seconds against a 30-ohm load is measured in joules. Aliya and Evelyn will compete in the middle school division. The girls’ interest in wind energy was piqued last fall during an agriscience class taught by Brenda Scheil. Last November, they hosted an all-day wind energy workshop in which more than 80 local students participated. Lately, the girls have been working on their turbine in their free time. Both say this project has inspired them to pursue careers in engineering. Aliya said she enjoys brainstorming and coming up with new ideas, such as the notion of making the turbine blades out of solar panels to capture power from both the wind and the sun. They plan to add a solar component for their entry in the Wisconsin FFA Agriscience Fair this June in Madison. Adding energy produced by light about doubles the turbine’s energy input. Scheil also offers a one-semester Green Energies course that grew out of her eighth-grade agriscience class. Launched for the 2017-18 school year, the class drew 11 students in its first year and 19 this year. She said she knows of no other Wisconsin agriscience department offering it. Richard Anderson, a retired high school technical education teacher from Darlington who serves as state KidWind adviser, said hands-on learning and problem-solving is the best way to engage students in learning. Producing electricity from wind is complex, he said, and students see there’s more to it than what meets the eye — spinning blades. Once engaged, many students find it difficult to walk away. A lifelong learner, he said he has been interested in renewable energy since the 1970s and closely observed EDP Renewables’ construction of a wind farm in Darlington. “I had to get a firsthand, up-close and personal look at the process,” he said, adding that he also has his own small, home-unit wind turbine. He became acquainted with the KidWind program and attended a training in Colorado before launching three teams in Darlington and one in Shullsburg that competed in the 2018 KidWind Challenge in Madison. Three teams advanced to the national event in Chicago, where they competed against more than 40 other middle school teams. Darlington teams took second and fifth places. Anderson said the contest consists of three parts plus two instant challenges. Forty percent of scoring is based on the energy produced by each team’s turbine in a wind tunnel, 30 percent is based on turbine and blade design and 20 percent is based on the team’s documentation and presentation about the design process and what they learned. “Judges ask questions and look for good, sound engineering processes and explanations, as well as creativity in their problem-solving,” he said. The last 10 percent is made up of hands-on, “pencil and paper problem-solving” with little or no preparation. Each instant challenge is limited to 30 minutes. “Last year, it was to build a sail car and see how far a 20-inch box fan could propel it, and then they had to construct a vertical axis wind turbine from scrap materials,” Anderson said. Following legislative updates, attendees to the Farm Bureau’s event headed to the State Capitol to meet with legislators, telling their farm story and asking them to support a number of items in Gov. Tony Evers’ proposed biennium budget, and some items not included in the budget. Brad Pfaff, secretary-designee of the Wisconsin Department of Agriculture, Trade and Consumer Protection, addressed more than 300 producers and industry leaders who attended the Wisconsin Farm Bureau Federation’s Ag Day at the Capitol on March 20. MADISON — Spring is the time of year when farmers are the most optimistic, Brad Pfaff, secretary-desginee of the Wisconsin Department of Agriculture, Trade and Consumer Protection, told members of the Wisconsin Farm Bureau Federation as they gathered for the 2019 Ag Day at the Capitol on March 20, the first day of spring. More than 300 Farm Bureau members attended the event, listening to leaders discuss transportation during a panel and receiving updates from others on items the bureau supports in Gov. Tony Evers’ 2019-22 biennium budget before “walking across the street” to share their thoughts with Wisconsin legislators. But before they did that, Pfaff recommended they remind their legislators of a few key things, including the need for 21st-century technology like broadband; the need for roads and bridges, not just interchanges and highways but town and county roads, too; their support of the investment proposed by Evers for K-12 education; the specifics of their farm and their farm’s story; and most importantly, that there are 72 counties in Wisconsin, that people live in all 72 counties and that many of those people are living in rural communities and small towns across the state. Specific to agriculture, Pfaff is hearing three main issues that are being talked about within the agricultural community. Along with prices and markets, he’s also hearing talk of water, hemp and dairy. “Water is getting a lot of attention,” he said. “Wisconsin is a water-rich state, with three of the state’s borders touching water. Water defines our state and is crucial for agriculture. “A balanced conversation about water needs to happen and farmers need to be a part of the discussion — and the solution,” he said. After a successful launch of the state’s pilot program for hemp in 2018, there is overwhelming interest in the now-legal crop, shown particularly by the increase in applications to grow or process hemp in 2019. Applications have increased by 500 percent over last year. Pfaff admitted that if any ag issue keeps him up at night, it’s dairy, and it’s personal to him. Wisconsin is identified nationally and internationally as “America’s Dairyland,” with the identity of the people of Wisconsin also tied to the dairy industry. He told attendees he’ll tell the story of dairy, and of Wisconsin agriculture, every day to anyone who will listen. In his 10th week at DATCP, he called on Farm Bureau members to provide assistance, advice and help as he navigates his new role and makes sure the state can continue to support those working in agriculture. “Agriculture is a powerhouse,” Pfaff said. “Some people call it an industry; I call it a community. Transportation and infrastructure are issues that should be bipartisan, with Mark O’Connell, executive director of the Wisconsin Counties Association, calling them “necessary ingredients for further success of the state.” And while the vast majority of legislators support infrastructure improvements, not everyone agrees on how much funding to allocate for it in the state budget. Craig Thompson, secretary-designee of the Wisconsin Department of Transportation, cautioned those in the room that transportation is an incredibly hard issue when you think of the needs of the entire state. He told farmers that they should advocate for their industry and what will impact them most but also keep the big picture in mind. However, Dan Cunningham, vice president of government relations and education with Forward Janesville, reminded people that Wisconsin legislators have continued to push transportation to the back-burner for more than a decade. “It’s time to do something real and stop kicking that can down the road,” he said. “Regardless of party, we have the opportunity to move forward,” said Jim Holte, WFBF president. The Farm Bureau supports a gas tax increase that provides an increase in motor fuel tax by 8 cents and an increase in original and transfer title fees by $10; a 10 percent increase in mileage aid payments to assist local governments in maintaining Wisconsin roads; and the extension of eligibility to receive driver’s licenses and identification cards to undocumented individuals if they comply with the driver knowledge and skills requirement. Although not currently in Evers’ budget, the WFBF asked members to support an innovative approach to Wisconsin’s dairy industry that uses research, innovation and technology to move the industry forward. The UW Dairy Innovation Hub would serve students at UW-Madison, UW-Platteville, UW-River Falls and beyond, putting emphasis on product innovation, soil health, water quality and animal health. With a proposed price tag of $7.6 million per year, the hub would receive 25 new faculty, including 12 new research fellows, 12 new post-doctoral fellows from UW-Madison, grant writers and funding for continued research. Holevoet also argued that the Dairy Innovation Hub would benefit much more than just dairy but also educate in the areas of land and water resource stewardship, human health and nutrition, animal welfare and health, and the growth of farm businesses and rural communities. “There really is a lot to this proposal,” he said. The Farm Bureau also is seeking funding for Cooperative Extension, specifically $15 million over the biennium to fund research and positions for state integrated research specialists who hold a joint appointment between a UW agriculture college and Extension. While the governor’s budget includes funding to increase UW-Extension county-based agricultural agent positions by 20 full-time employees, Jordan Lamb, a Wisconsin government relations attorney for agricultural associations at DeWitt LLP Law Firm, asked members to support an amendment to include funding for these specialists too. Since 1990, the number of integrated research specialists at the UW-Madison College of Agricultural and Life Sciences has decreased by 45 percent. In the last four years, funding for these specialists at CALS has decreased by almost $900,000. “This has a direct impact on the agriculture economy,” Lamb said, adding that the research conducted not only benefits the UW and its students but also farmers who can use the research on their operations. Lamb also asked Farm Bureau members to show support for the UW School of Veterinary Medicine, a project that has been included in the governor’s budget. The school was built in 1983 to see 12,000 patients annually; however, the school has grown to see 27,000 patients a year, which has forced patients to wait weeks or months for an appointment. The school has trained more than 50 percent of the veterinarians practicing in Wisconsin, she said, and ranks among the top five schools of veterinary medicine in the nation. The total cost of the project is estimated at $126.7 million, with $38 million from private donors and a request of $88.7 million from the state. Evers has declared 2019 “the year of clean drinking water,” and Farm Bureau members were asked to support a handful of water-quality initiatives proposed in his budget. About $70 million for water-quality projects has been included in the budget, including issues not particularly associated with agriculture, like the replacement of lead pipes and the resolution of chemical contamination issues. A Speaker’s Task Force on Water Quality recently was announced, and the group met for the first time March 20 — the day of Ag Day at the Capitol. The task force plans to hold public meetings around the state in the future to hear the concerns of residents and gather ideas as they relate to water quality. Those public meetings are an opportunity for farmers to join the discussion, as those in agriculture are directly linked to the issue, Lamb said. She also reminded members to support water-quality initiatives both at DATCP and at the Wisconsin Department of Natural Resources. At DATCP, these include support for additional funding for county land and water conservation staff, funding for nonpoint cost-sharing and producer-led grants in watersheds, and $10 million in bonding for grants to counties for the implementation of land and water resource management plans, including cost-share grants to help landowners. At the DNR, she asked members to support nonpoint funding, particularly $6.5 million in bonding for nonpoint source pollution abatement targeted runoff management infrastructure projects and $400,000 each year for nonpoint targeted runoff management grants used to implement performance standards in northeastern Wisconsin. Another important component to support is nonpoint abatement outreach, with $730,000 proposed each year for contractual services related to nonpoint source pollution abatement. It’s why he asked Farm Bureau members to support the addition of three full-time employees at DATCP to assist in licensing, registration and testing of hemp. Funding also will assist with the conversion of the industrial hemp pilot program into a state management plan for hemp as a controlled crop as allowed under the 2018 Farm Bill. The farm bill indicates that states may submit their own plans to the U.S. Department of Agriculture for primary regulatory control, and Konopacki said he believes that’s the way for Wisconsin to go. He also mentioned that legislators are working on Hemp 2.0, a bill that would fix holes in Act 100 and provide more resources for DATCP and the industry as a whole. It doesn’t hurt to thank legislators for supporting previous hemp legislation and continued improvements to the program, he added. While most Wisconsin farmers don’t have to worry about damage from bears, there are a handful who deal with this issue regularly, sometimes racking up damages exceeding $10,000 per farm. Bob Welsh, a representative of the Wisconsin Bear Hunters’ Association, asked members to support a non-budget item that proposed to repeal the $10,000 limit on wildlife abatement damage claims program. If the limit is repealed, it could benefit not just those who sustain bear damage but those seeing other damage caused by wildlife. Along with the repeal of the limit, Welsh also is asking for the installation of electronic monitors on all live traps used for catch-and-release programs by the DNR. Currently, if a farmer has a bear trap on their property, they are required to check each trap in person daily. Welsh sees the use of technology as an investment by both the farmer and the DNR. The top five candidates for the 72nd Alice in Dairyland were announced on March 15 in Green County, which will serve as the host site for this year’s three-day finale event in May. Pictured, from left, are Tess Zettle, Juda; Mariah Martin, Brooklyn; Kaitlyn Riley, 71st Alice in Dairyland; Abigail Martin, Milton; Cassandra Krull, Lake Mills; and Sarah Achenbach, Eastman.